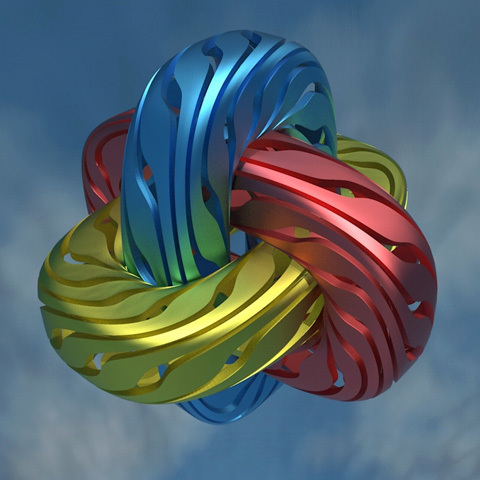 Borromean rings are three interlinked rings such that no two rings are linked. 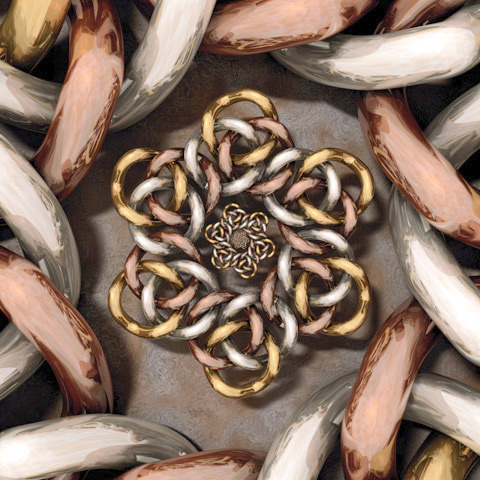 In other words, the three rings cannot be separated and yet no two of them are linked. It can be shown that there is no solution for flat rings, it can only be constructed by perturbing the rings in a third dimension. The rings can be formed with various base geometries including rectangles and triangles as shown below. One way (as shown below) to create the rings mathematically is with the following three parametric equations, one for each ring. Featured on the cover of the HPC (High Performance Computing) magazine, 20 July 2001. Contribution by Lindsay Taylor. "Each of the 3 links was created using a mesh supertoroid script and is an interlocked pair of (4, 3) torus knots."